Peyper rose through the ranks in South Africa quickly, making his Super Rugby bow in 2008 while still in his 20s. In 2011 he was named as an official for the Junior World Championship in Italy, taking charge of the Final as New Zealand beat England. 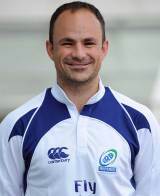 The following year he was promoted to the International Rugby Board's elite panel and tasked with officiating Scotland's tour meetings with Australia and Fiji.